Water births are becoming increasingly popular as a choice of delivery for expecting mums, and it’s easy to see why with many believing doing so is more relaxing, efficient and natural than a traditional birth. Here’s everything you’ve always wanted to know about a water birth. A water birth is literally that – where a woman labours and gives birth while submerged in water, in any variety of positions. Usually it’s done in a special birthing pool either at a hospital or home; however, sometimes a woman may give birth somewhere else like a bathtub. A midwife will guide you through your labour, and when the time comes for your baby to be born, they will gently and slowly lift him out of the water which is when he will take his first breath. Until that moment, his oxygen has been supplied via the umbilical cord so there is no risk of him drowning before being exposed to the air. You can stay in the pool afterwards and breastfeed, and possibly deliver your placenta there too (unless there is a lot of blood). Yes! Contrary to previous beliefs, recent studies have shown that in circumstances where there are no complications or health issues with mum or bub, water births are no more risky than traditional birthing methods as long as the mother is not left alone at any period and has an experienced midwife on hand. Just like a dry land birth, your baby’s heartbeat will be monitored by the midwife using a waterproof handheld Doppler machine. However, there is an 11 per cent higher chance of vaginal tearing. Toddler meets baby: Is the most amazing water birth photo EVER? Forget water births. Sea turtle births are where it’s at. It’s relaxing – As much as childbirth can be! The water can help produce more endorphins which might reduce the need for medical painkillers. You have your own space – The birthing pool is nice and enclosed which can feel more private, special and natural for the birth as opposed to a clinical hospital bed. Your partner can even hop in there too (if you wish). It’s a helpful aid – The buoyancy of the water can help you to easily move into various positions to get comfortable. It’s been also known to make labour faster in the initial stages for some women and make you less tired as the water supports your body. It’s a smooth transition for baby – Many believe that a water birth feels more natural for a baby as he moves from his amniotic fluid-filled sac into the world. It’s a messy affair – The water can quickly become yucky from blood, mucus, urine and poo which can be confronting, although the midwife will have a special ‘poop scoop’ net to catch any floating faeces. 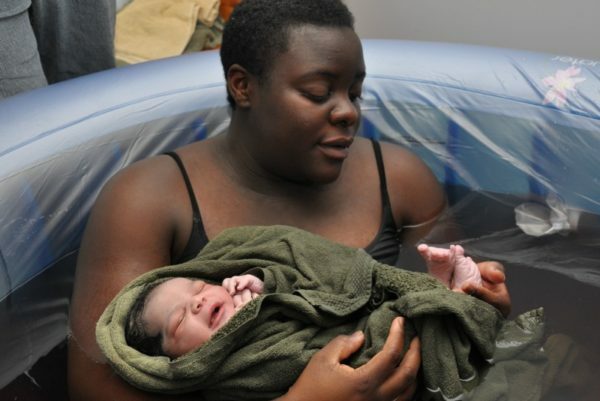 Not all hospitals are equipped – Not all birthing suites have birthing pools available or midwives experienced in water births. You need an expert – You have to have a midwife or doula experienced in water births to assist you, and they may not be available when you go into labour. It can prolong labour – In some cases, water births can actually make labour longer. Tough for emergencies – If there’s a complication, getting out of the pool to get attended to can delay you or bub getting the help you need. How do I have one? Tell everyone your wishes in advance – Make your doctor, birthing partner, the midwives or your doula aware of what you want to do and have the process explained to you in detail. Ensure there’s a birthing pool and expert available – You may need to move hospitals so they can accommodate you, or hire a birthing pool yourself if opting to give birth at home. Get a few aids for the birth – You might want a cushioned headrest, special swimmers (although most women go naked), a stool or small step ladder to help you get in and out, the poo net (! ), lots of towels and a robe for drying off afterwards, plenty of water to help you stay hydrated and perhaps some music. Don’t be disappointed if it doesn’t happen. Nature has a mind of its own, so despite the most meticulously laid out plans babies will often enter the world in a completely different way to how you had intended. For example, you may be uncomfortable in the bathing pool and decide to hop on to the floor or a bed instead, or your labour might be very long and challenging and an emergency c-section determined as the safest option. So if you don’t get the amazing water birth you dreamed of, don’t despair because you’ll have a beautiful baby regardless of how they came out. And you can always try again next time! Did you have a water birth? Did it go according to plan? Share your experience with us on Facebook!